The Crisis Caravan: What’s Wrong with Humanitarian Aid? But in 1995 at Goma, a camp for Rwandan refugees, the Red Cross and more than 300 other aid organizations – including big names like UNICEF, Oxfam, and the World Health Organization – had a difficult time upholding these principles. In The Crisis Caravan, journalist Linda Polman paints a grim picture of this and a handful of other humanitarian missions that raise the question of whether aid is ever or even if it should be impartial. Through extensive interviews with aid workers, law enforcement, civilian refugees, and doctors on site, Polman tells quite a different story of Goma than those that appeared in the press at the time. As a firsthand witness, Polman describes how Hutu militias would cross into Goma to hunt Tutsis. Some refugees at Goma were in fact Hutu militants who had international warrants out for their arrest – for crimes of genocide. Suspected Hutu “traitors” would arrive at the infirmary with missing arms and legs. But when an epidemic of cholera broke out at the camp, horrified media reports drew more and more funding to the site. “The Hutus were presented to the public in the West mainly as innocent victims of the cholera bacterium,” Polman writes. “What the aid organizations and journalists failed to mention was that some of the dead in Goma had not succumbed to cholera but had been murdered by Hutu militias, on suspicion of disloyalty.” Meanwhile, many Tutsi refugees remained without aid or access to the international community. Goma isn’t the only aid project that Polman indicts. She recounts her 2002 travels to Sierra Leone, which had then received the most humanitarian aid money per capita for three years running, yet was still named the world’s poorest country by the United Nations Development Program. In Freetown she dined with donors and NGO managers, who, anticipating still more funding for their organizations, raised glasses of champagne to celebrate the UNDP’s designation. In Liberia that same year, Polman traveled through villages outside the capital of Monrovia. Along the way, her transport vehicle was stopped at checkpoints where she had to pay food or money to pass. “No access to war zones without payment, whatever form it may take,” she writes. “Especially if you’re a humanitarian.” According to Médecins Sans Frontières, the president of Liberia required 15 percent of aid be paid to him, in cash. In Somalia, there were “entrance fees” of nearly 80 percent, which had to be paid to warlords. And in 2006, the U.N. mission in Afghanistan reported that aid groups in the province of Uruzgan directed one-third of their support directly to the Taliban. Polman headed to Afghanistan in 2007 to find the aid community in hiding. After former Secretary of State Colin Powell called aid workers “an important part of our combat team” in 2001, many groups found themselves in constant danger. As they told Polman, “Since the start of the war on terror and the military-humanitarian reconstruction projects in frontline states, people can no longer tell the difference between ‘real,’ neutral humanitarians and reconstruction troops disguised as humanitarians.” Because of this confusion, aid workers often had to delegate the funds and management of their project to local partners, often losing track of where the money went. Polman quotes one U.N. investigator who tells the story of a $150 million housing project: the funds exchanged hands so many times, with each person taking a cut of the money, that it ultimately ended up buying only a bit of firewood. With 37,000 NGOs and nearly $120 billion in annual funds in their hands, it is nearly impossible to track accountability in the humanitarian aid system. Polman puts the burden for review on journalists and donors. “Most donor governments and private donors give money based on newspaper headlines, not the extent and urgency of human suffering,” she writes. After what happened in Goma, hundreds of NGOs developed a handbook of standards – the Sphere Project – and another NGO network began publishing an annual Review of Humanitarian Action. But as recently as May 2008, the publication again lamented the lack of “a systematic and regular means of assessing…overall performance,” saying aid groups ought to function more as a collective than what has become, in practice, an unregulated free market industry. The limited number of contracts creates antagonism between groups, Polman argues, and puts every altruistic dollar at risk for manipulation and misuse. Buy the Book: Metropolitan Books, Skylight Books, Powell’s, Amazon , Border’s. 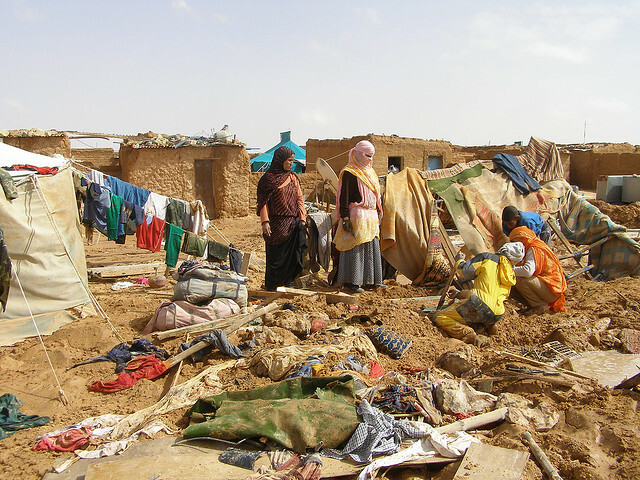 Further Reading: A Bed for Night: Humanitarianism in Crisis by David Rieff and Development as Freedom by Amartya Sen.
*Photo of a refugee camp courtesy Western Sahara.